The third brightest star in the night sky, Arcturus is overhead as darkness falls. 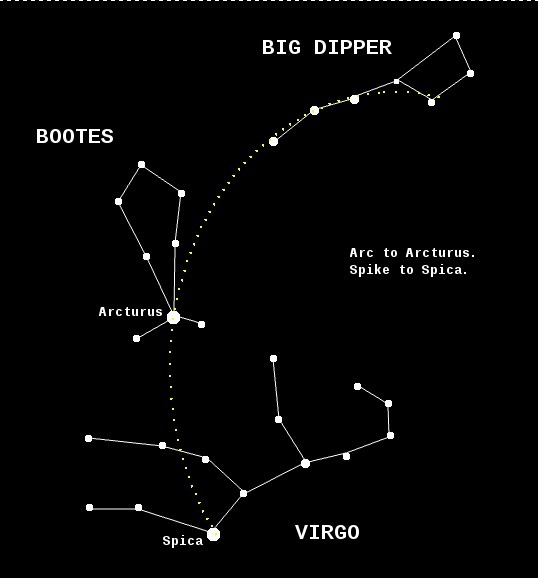 Look to the north, find the handle of the dipper as illustrated above, and follow the arc as shown above. Continue down to Spica, and follow the ecliptic to the west to find Saturn, Mars and Venus, which will be close to the Moon. Arcturus, or Alpha Boötis, is located about 36.7 light-years from the Sun. 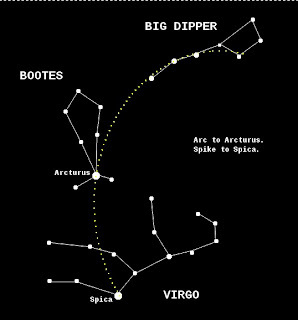 It is the brightest star of Constellation Boötes, the Herdsman or Bear Driver, forming his left foot. Boötes may be a hunter, on the tracks of the Great Bear, accompanied by his two dogs Asterion and Chara (the "Canes Venatici"). And yet the constellation was once known as Arctophylax which means the protector of the Bear. Perhaps it was the Romans who changed his role, for they called him Venator Ursae: the Bear Hunter. Nowadays Boötes is generally considered to be a Herdsman (as in French: Le Bouvier), as he eternally shepherds the stars around the North Pole. The constellation was known in antiquity, with the first recorded appearance being in Homer's Odyssey. In Book V Odysseus sails his ship by the stars, using the Pleiades, the Bear, and Boötes ("which set late") to reach his destination. Arcturus is a type K1.5 IIIpe orange giant star — the letters "pe" stand for "peculiar emission," which indicates that the spectrum of light given off by the star is unusual and full of emission lines. This is not too uncommon in red giants, but Arcturus has a particularly strong case of the phenomenon. It is at least 110 times visually more luminous than the Sun, but this underestimates its strength as much of the "light" it gives off is in the infrared; total power output is about 180 times that of the Sun. The lower output in visible light is due to a lower efficacy as the star has a lower surface temperature than the Sun. Arcturus is notable for its high proper motion, larger than any first magnitude star in the stellar neighborhood other than α Centauri. It is moving rapidly (122 km/s) relative to the solar system, and is now almost at its closest point to the Sun. 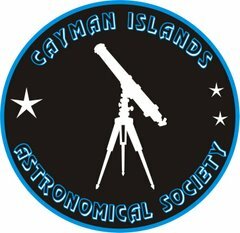 Closest approach will happen in about 4000 years, when the star will be a few hundredths of a light year closer to Earth than it is today. Arcturus is thought to be an old disk star, and appears to be moving with a group of 52 other such stars. Its mass is hard to exactly determine, but may be slightly larger than that of the Sun (1.1-0.4+0.6 solar mass). Arcturus is likely to be considerably older than the Sun, and much like what the Sun will be in its red giant phase. 53 probable members of a group of old disk stars appear to be moving with Arcturus. As the star is more massive than Sol, it has evolved faster into a helium-burning "clump" giant, possibly within five to eight billion years since hydrogen ignition. As a star that has evolved out of the "main sequence," Arcturus has fully shifted from the fusion of hydrogen to helium in at its core to the fusion of helium to carbon and oxygen, with trace activity of other nuclear processes. However, Arcturus is somewhat brighter than expected for a stable helium-burning star. Among the heavier elements and molecules detected in its stellar atmosphere have been iron (Fe-0.5) and CN. This helium-burning, orange-red giant stage is relatively brief, lasting tens to hundreds of million years (e.g., lasting around 700 million years for a star of one Solar mass like the Sun). Eventually, the star will lose much of its current mass, from an intensified stellar wind that eventually puffs out its outer gas envelopes of hydrogen and helium (and lesser amounts of higher elements such as carbon and oxygen) into interstellar space as a planetary nebula. The result will be a planet-sized, white dwarf core that gradually cools and fades in brightness from the shutdown of thermonuclear fusion. Prehistoric Polynesian navigators knew Arcturus as Hōkūleʻa, the "Star of Joy". Arcturus is the zenith star of the Hawaiian Islands. Using Hōkūleʻa and other stars, the Polynesians launched their double-hulled canoes from Tahiti and the Marquesas Islands. Traveling east and north they eventually crossed the equator and reached the latitude at which Arcturus would appear directly overhead in the summer night sky. Knowing they had arrived at the exact latitude of the island chain, they sailed due west on the trade winds to landfall. If Hōkūleʻa could be kept directly overhead, they landed on the southeastern shores of the Big Island of Hawaiʻi. For a return trip to Tahiti the navigators could use Sirius, the zenith star of that island. Since 1976, the Polynesian Voyaging Society's Hōkūle‘a has crossed the Pacific Ocean many times under navigators who have incorporated this wayfinding technique in their non-instrument navigation. The Koori people of southeastern Australia knew Arcturus as Marpean-kurrk, and its appearance in the north signified the arrival of larvae of the wood-ant (a food item) in spring. The beginning of summer was marked by the star's setting with the sun in the west and the disappearance of the larvae. The star was also known as the mother of Djuit (Antares), and another star in Bootes, Weet-kurrk.